A DIY answer to the question: how can pedestrians legally cross a street wherever they want to, and not only at the whim of traffic planners? 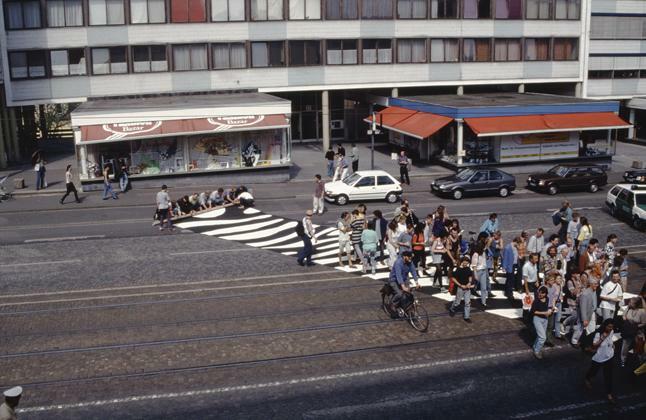 Gerhard Lang’s zebrastreifen, or “zebra crossing,” allowed a 600-person procession to cross the streets, alleys, backyards, and car parks of Kassel without jaywalking. The procession honoured Lang’s friend, collaborator, and former professor, Lucius Burckhardt, the inventor of the field of Spaziergangswissenschaft, or “Strollology.” Burckhardt adopted the perspective of the stroller in formulating his criticisms of prevailing automobile-centric planning practices. Gerhard Lang is a German artist who investigates human perception through its relationship with landscape.